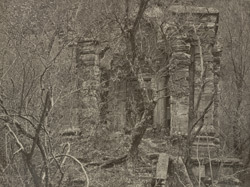 Photograph of an ancient temple on the road between Uri and Nowshera in Jammu and Kashmir, taken by John Burke in 1868. This view of the temple ruins is reproduced in Henry Hardy Cole's Archaeological Survey of India report, 'Illustrations of Ancient Buildings in Kashmir,' (1869), in which he wrote, 'As may be seen from the photograph, the overgrowth of trees and weeds is great, and the building is in a state of ruin. The presence of colonnades would indicate that the building occured about the fifth century.' Kashmir is dotted with the remnants of temples from its pre-Islamic history prior to the 14th century, many of which were deserted or sacked by the early 15th century. Sheltered on one side of the Pir Panjal range, and near the crossroads of Asia, Kashmir received influences from Buddhist, Gandharan and Bactrian culture and developed its own distinct style of architecture which coalesced in its medieval period of temple building. Buddhism, Vaishnavism, Shaivism, all were popular in Kashmir. The temples usually feature great blocks of stone constructed in square or rectangular shapes of impressive strength and simplicity, with pyramidal pediments, pent roofs and trefoil arches. Even when ruined they show how their builders successfully matched their solid forms to their mountainous environment.